What’s all this talk in the industry about making use of your tipper as a water cart? Good question! 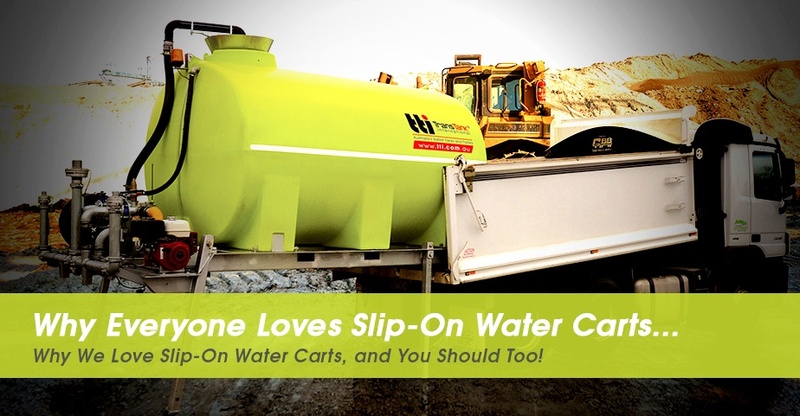 ‘Slip-on’ water carts is a buzz term in the industry right now… And rightly so! 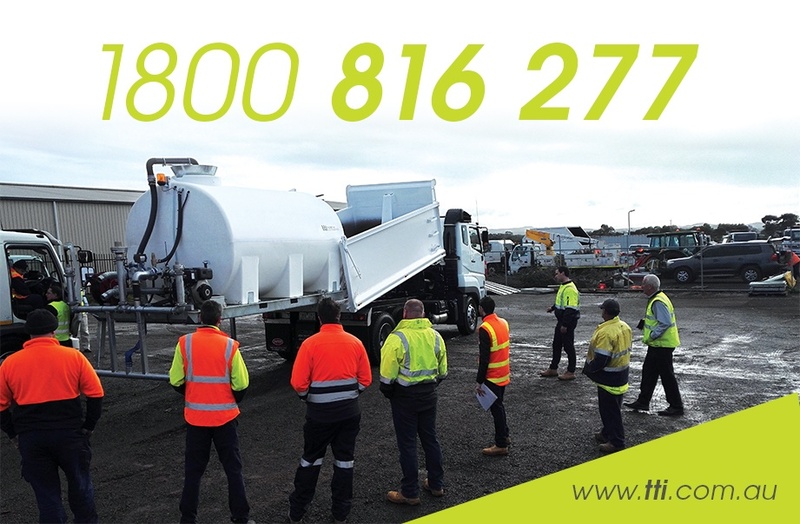 Yes, we acknowledge there is still a big need for dedicated water trucks, and there always will be, however for the smaller operator who doesn’t have a need for a water cart all year round, the slip-on, slip-off convenience of a TTi water cart is the ultimate answer. Why is it the answer? The self loading leg system means that you don’t need any other heavy machinery to slide the unit in and out. The roller wheels on the front of the frame allow it to easily slide up the floor of the tipper body. The wireless in cab controls mean there is no need to run cables into your cab, functional and easy to use! Each unit comes with the option of a locking bar to utilise the airlocks on the back of the tipper. This secures the unit from wanting to slide out. » Confirm the width of your tipper body (a 10,000 or 13,000L unit require 2250mm). Some aluminium tipper bodies will have a lip around the top of the body which reduces the width slightly. » Check the voltage of your truck, is it 12 or 24 volt? » Cut an airline somewhere at the back of the truck and insert the quick connect T piece. The units is supplied with a length of airline. There is no need to regulate the pressure through this line as the unit has its own pressure regulator installed. » Secure the unit into the tipper and away you go! 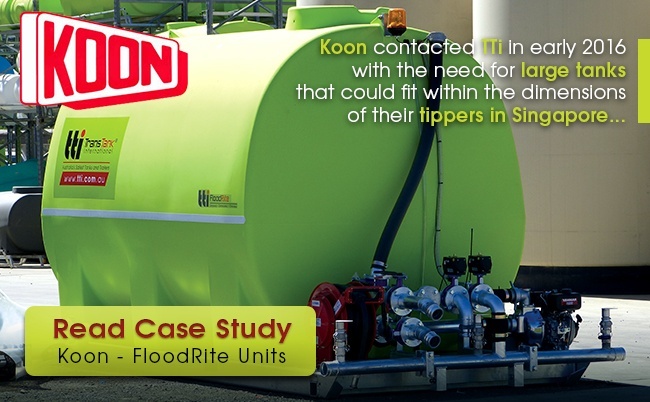 Koon contacted TTi in early this year with the need for large tanks that could fit within the dimensions of their tippers in Singapore. These tanks needed to be as light weight as possible to maximise carrying capacity, and needed to arrive in Singapore by a particular date in order to commence a work contract. For freight purposes, units needed to fit in inside an open top container. TTi manufactured these units to schedule, and they arrived to Koon in Singapore before the commencement date of their contract. Koon have been so pleased with the units that they have since purchased a number more, and are speaking with TTi about a number of different configurations for potential future projects. TTi worked with Koon to decide what configuration would best meet their requirements and built the units accordingly. Koon’s units were 13,000L diesel powered FloodRite water carts with spray heads and dribble bars. All units were fully in cab controlled. All units can be slid in and out of tippers as required.